Level 2 Control System is a complete system for level 2 steel melting shops. This system helps us to improve our knowledge in the all sectors of industry and ongoing activities of monitoring. Meltshop Level 2 improve your production process and reduce costs. Some parts of the steel shop can be changed. (as the case maybe) For instance, some organizations don`t have Vacum Degassing, or Preheating Scrap section. - Lifting your materials in your vehicle according to classification. - Check the tonnage you have. - Reporting Scrap. Report shall contain each of inventory that you have. In the steel industry, electric arc furnaces (EAFs) are used to melt metals and other ingredients to form steel. The heat needed to melt the metals is generated by passing current through one or more carbon bodies, commonly referred to as graphite electrodes, and forming an arc between the electrode(s) and the metals in the furnace. A Control system for parameters of an electric arc furnace includes monitoring the furnace's primary current transformer; collecting data; transmitting the collected data to a SQL server; and displaying the collected data on the monitor, but applying Control 2 System can range from basic automation Level 2 and technological control packages for all areas of electric steelmaking. - Scrap Receipe selection is configured of Level 2 System. - Sorting Scraps based on to production which minimize specific operating costs. - Import the inventory database to SQL Database. - Information about furnace heats collected according to any or all of single heats, daily heats, daily shift heats, weekly heats, monthly heats, heats by date range and conditions. - Main data of energy save as minimum and maximum values. Thus improvement of parameters can be possible for similar production quality. - Storing reason of system pause and define the information on failures and chasing the process. - Generate ferro-alloy according to analysis from laboratory and chasing ferro- alloy Importing saving gravity, laddle number, inventory number to laddle furnace and controlling all this process with Level 2. Ladle Furnace and Arc Furnace have similarities as well as differences. Ladle Furnace does not have Scrap Feeding System, therefore data from this section record and report with total inventory number. Ladle Furnace is also collecting data; such as Inventory Number, Material Feeding, Heat Input, Labororaty Findings and transmitting this collected data to a SQL server with Level 2 System. Besides that Ladle furnace is coordinately sharing data with Continous Casting Machine part. At the same time it is also sharing inventory number, casting time and informations of situation with Arc Furnace. Ladle Furnace also provides to suggest and save recipes with Level 2 Control System. 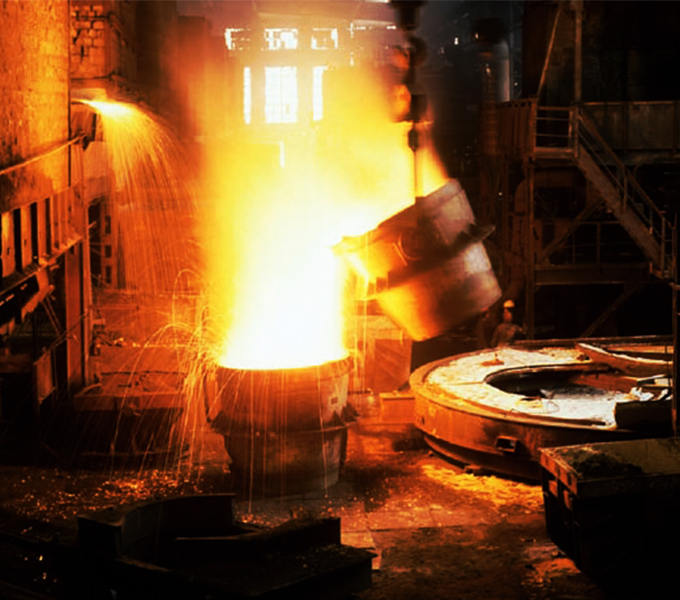 Continous Casting is a process which metal is melted in a furnace and transferred in a tundish. This process has evolved to developed productivity, quality and cost efficeny. Steel is tapped into a ladle and taken to the continous casting machine. Later on it taps from the receiving ladle to tundish. Afterwards, it drops down into crystallizer to cast into bloom. Continuos Casting Machine involves to the Control Level 2 System by casting data which transmitted from ladle furnace. Casting data includes; ladle number, heat input, laborotary findings and time of origins from ladle furnace. - Getting information about tundish according to tundish number. - Information about situoations are casting by Control Level 2 System and saved into the SQL Database. Material Handling System comprises scrap yard, electric arc and ladle furnace. All these parts are pursued by Level 2. Feeding System provides an efficent way of feeding a wide range of fabrics tot the cutting table with edge control. Material Handling responds to requests from scrap yard, ladle and arc furnace according to adresseed material tonnage. After this process, material tonnage has arranged by inventory number and date. Lastly database that we have from matereial feeding transmitted to SQL server.